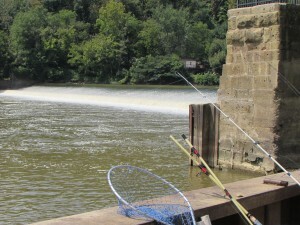 A lazy summer day sees fishermen with their poles and catch sitting on the banks of the gently flowing Muskingum River enjoying the sounds of water rushing over Devol’s Dam near Marietta, Ohio. Just a few hundred yards upstream, township trustees oversee a project to reduce stream bank erosion to maintain this tranquil setting. 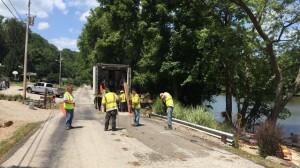 This stabilization is imperative to saving not just the stream bank, but also the road that is access to homes along this portion of the Muskingum River. As flood waters have eroded the riverbank and caused road slippage, multiple efforts and many thousands of dollars have been focused on retaining the stream bank, only to see continued decline. With financial support through a Partners in Watershed Management grant with Muskingum Watershed Conservancy District, the township is working with Uretek USA on an underground polymer injection technology. By infiltrating and compacting unstable soil and voids, this technology creates soil stabilization. The project began with Dynamic Cone Penetration (DCP) testing to measure soil solidity and identify volatile zones. Testing was completed to a depth that indicated solid rock. Injection holes were then drilled to various depths in patterned grids. Overall length of the three injection regions ranged from 50 to 100 linear feet. Utilizing the URETEK Deep Injection Process, a total of 11,175 lbs. of environmentally safe and water resistant expansive polymer were injected down into the soils through small ¾” diameter tubes, drilled and inserted from the pavement surface. This new-to-Ohio riparian barrier process is designed to be economically and environmentally beneficial. The work was completed in four days with only one lane closed during the day and all lanes open during the night. Without this repair, the adjoining road would be abandoned and homes in the area would dramatically lose value. Families might even be forced to relocate. Continued erosion affects water quality by introducing pollutants and sediments into streams. It reduces the ability to grow trees in the area that shade and cool waters helping prevent algae growth. And it disrupts the habitat of many species of plants and animals. By engaging multiple entities, this project is an example of how Ohio State University Extension works to create opportunities through collaboration. These collaborations empower communities to solve problems that impact the lives of their residents. Posted in Environmental	Tagged collaboration, erosion, soil stabilization	Bookmark the permalink. ← Is it time for your community to conduct a Business Retention and Expansion Survey?